Seems like it stopped raining at home for no more than an Hour, the Aquilegia's are just loving it but the Irises are not so keen with the constant rain. I'm so glad I am just judging Irises this week-end and not showing. Tall Bearded Historic Iris "GLACIER "
Many white irises are now on show, but so many damaged by the rain and with more rains to come this is not going to be a great bloom season for the early varieties. Despite the weather 'Glacier' a French raised variety has managed to keep its head up, and a variety taller than most, is liked a lot. 47 years old and I have always considered 'Glacier' to be a significant transitional iris from the classic form to the more modern form of white Iris blooms. It does however slowly revert back to the older form the older the blooms become. Tall Bearded Historic Iris "LOS ANGELES "
The heirloom iris 'Los Angeles' flowering in the rain at home today, its the sibling to the Dykes Medal winning plicata 'San Francisco' but a much better grower, and sure is a sight to behold. Foreword, 'A little gossip about Iris'. 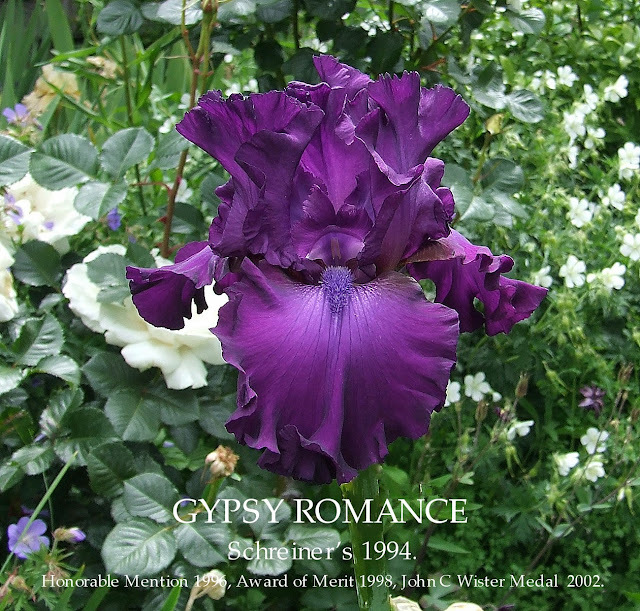 The curious and interesting part of it is the fact that the buying public, the rank and file of people who grow irises in their gardens for their own pleasure so often disagree decidedly with official awards. As an example the first American award of the Dykes medal was made to San Francisco, first of the giant plicata's. Its sister seedling, Los Angeles outsells it year in and year out by a wide margin. 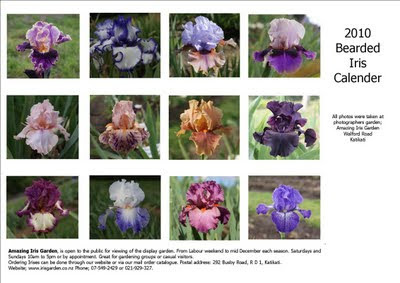 The selection of the 50 and 100 best Irises by the accredited judges of the American Iris society also places Los Angeles ahead of San Francisco. This should not be taken as at all discounting San Francisco, a great and wonderful Iris, finest of the giant plicata type, but shows the fallibility of official ratings. LOS ANGELES (Morh 1927) M. 46" Fragrant. Great white flowers of fine shape and texture ; the standards faintly edged blue, falls beautifully marked red brown at the base and the blue style arms lend a note of clear colour to the centre. One of the most beautiful irises we list. It is perfectly hardy and has stood in our garden for years unprotected. Snowy white standards and falls with a slight stitching of coerulean at the haft, and clear blue style arms, Los Angeles is an exquisitely sculptured beauty with the finest satin sheen. It is tall, vigorous, and well branched- a classic Iris that is a cornerstone in any collection worthy of the name 3½ ft. The Iris Year Book 1942, Bearded Flag Irises-An Initial Thirty.By F. Wynn Hellings. LOS ANGELES. Although reputedly tender in some districts, probably on account of its mesopotamica blood, it has never given me any trouble or demanded any special treatment. My favourite among plicatas and superior to any in sheer aristocratic beauty. The large white flowers on 4 feet stems, have a reddish flush on the fall hafts and the blue style-arms add piquancy. It is free flowering, increases rapidly, and is quite a healthy Iris. 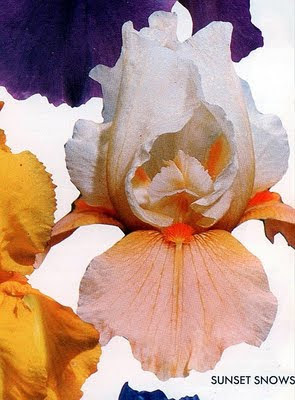 Tell’s Iris Gardens, Iris Catalog and Hybridizers handbook, Provo, Utah, 1951. $19.50 (NZD) plus $2.00 postage and packing for New Zealand customers or $4.00 for overseas postage. Pictured above flowering at home today I. germanica var. 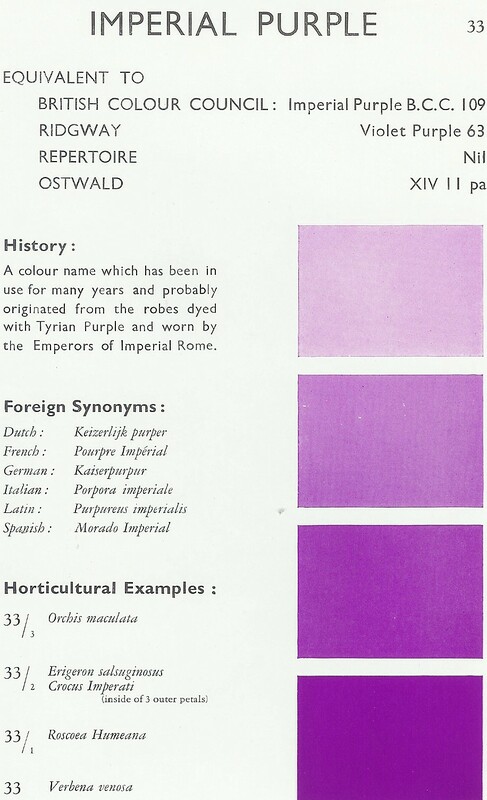 vulgaris, an historic garden variety, and is a Natural Hybrid, recorded as been cultivated in gardens for centuries. This is no individual variety but an abstraction from a group of varieties which agree in the following characters ; Leaves of some length in winter ; flower stems liable to destruction by frost before the emerge from the leaves ; stems bearing a terminal head of two flowers, a lateral branch three or four inches long and between them another short stemmed head or two ; spathes scarious in the upper half, green more or less flushed with purple at the base ; capsules narrow, oblong, triangular in section; seeds very few, oval not flattened; standards usually a little paler than the hafts and often bearing a few straggling hairs on the haft. The nearest approach to a wild form seems to be I.kochii Kerner (1887) a rather dwarf plant not growing to a height of much more than two feet with rich red purple flowers of particularly smooth outline, not unlike that of albicans, and without any white ground showing between the thick brownish veins at the end of the haft. 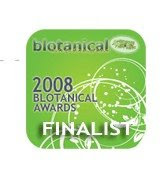 Wendy Begbie and her team from the Amazing Iris Garden will be at the 'Just Gardening' show at Kumeu, this Saturday!!!! Lots of Quality Bearded Irises in pots for sale. Saturday 26th September 9am – 5pm. Kumeu Show Grounds, Access Road, Kumeu. Plants delivered to your car! This promises to be another huge success. Wendy also has a new web site which is pictured above (Click for link). A Gardening delight, not to be missed. No fluorescent lighting was used in the production of these photos. 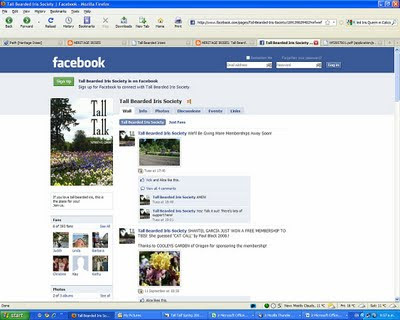 I was wondering just how long it would take before any Iris Society would embrace Facebook for promotion of membership, well it has happened!!!! The Tall bearded Iris Society to help with the promotion are "Giving away Plants" and get this "Giving away free membership" using a competition format of 'guess the Iris name' . They have sponsorship from some forward thinking Commercial Gardens who are supplying plants and or underwriting the membership fees. 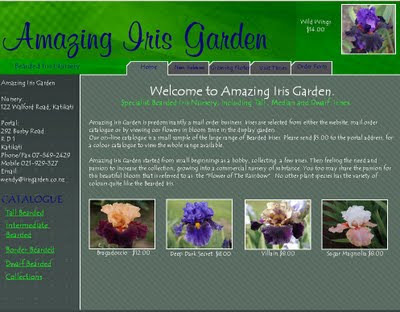 With 390 fans on the site within 8 weeks and growing that's more than some Iris Societies total membership. What will Morph on this site when the membership campaign is complete will be interesting for sure. It would wise to bookmark the site as more membership packages will be given away soon. Well done, 'Tall Bearded Iris Society' and to the supporting commercial growers for thinking outside the square and embracing E media. A big hat tip to you all. 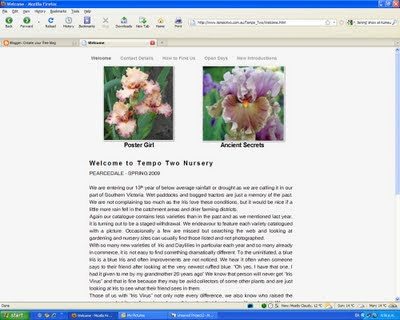 16/10/09 It has since been brought to my attention that the American Iris Society is also on Facebook but with only one message on the wall posted 29th July 2009 and 5 fans at time of writing it is somewhat insignificant and dated when compared with 'The Tall bearded Iris Society' effort. 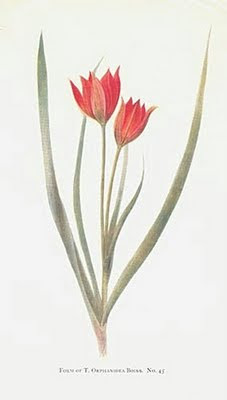 William R Dykes, one of thee great giants of the Iris world also bred tulips and his book 'Notes on Tulip Species' is still widely referenced. 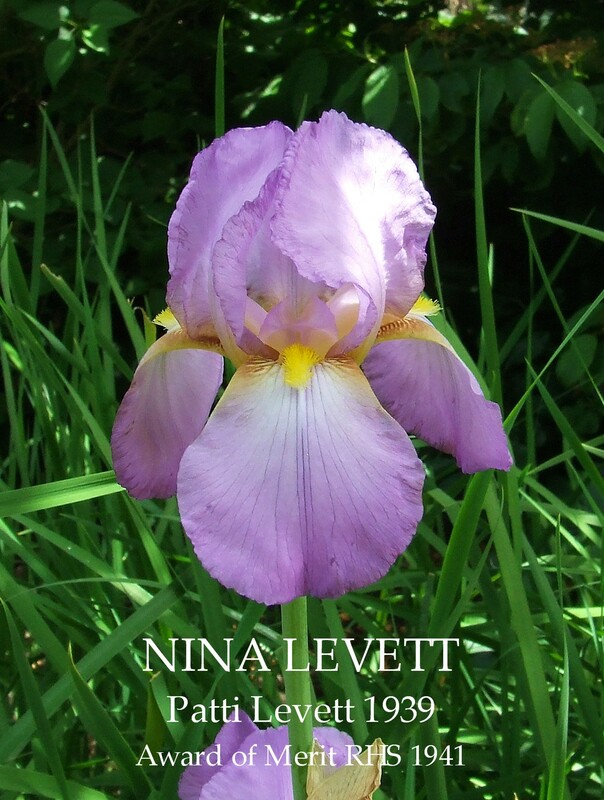 I came across this book whilst researching Irises. Published after his death in 1930. Illustrated and Edited by his wife E. Katherine Dykes, with the introduction by Sir A. Daniel Hall. This rare book is held at the National Library of New Zealand and is well worth the trip to Wellington to view the incredibly brilliant Illustrations like the one displayed above. Last time we visited the Botanic Gardens in Wellington it was a grey and overcast day about 4 weeks ago. Just the same this Saturday but with rain . (It was hard to keep the rain off the camera lens ) 'Tulip Sunday' at the gardens this year is 27th September which is another two Sundays away and as you can see there will be a powerful amount of finger crossing to keep some of the display beds at peak. Another photo taken in the interesting historic Iris collection of Mrs Mary Greaves in Masterton. 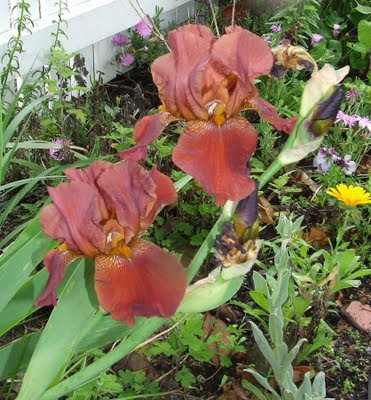 It is the Jean Stevens Iris that I am looking forward to seeing flowering again this season. I have always considered this to be one of the Neon Sign's for Jeans breeding and the reference in her hand written notes of 'Very Brilliant' could also apply to the hybridiser herself. Its from a 1936 Carl Salbach Iris 'Radiant' with its standards of golden bronze and falls of velvety brick red, and was crossed with the 1939 copper apricot self of 'May Day' by David Hall hence the name 'Radiant Day'. Growing this iris in front the dark green leaves of camellias would make for an amazing colour contrast. The great thing about Bearded Irises is that just about anyone can grow them, so for the new and even the more accomplished Iris Growers, 'Darkside' is a 'must have' and is generally sold for very reasonable prices. My recommendation is at the very least, to put this Reblooming Iris on your wish list. The large silky rich and ruffled dark purple black blooms with purple ebony beard, has a distinct purple base to the leaves.(PBF). A vigorous and utterly reliable garden iris which excels in full sun. Whilst the photo below is not great,In fact its a bloody shocker, and will post a better shot this bloom season (see above) it does show why this iris has a prominent planting in our gardens, and for at least three weeks it is one of the best knockout clumps. Yes that Progenitor of the great Schreiner Blacks, 'Black Forest' is in the back ground pedigree on the Pod side and amazingly Jean Stevens' introduction 'Black Belle' is in the pollen side a few generations back. 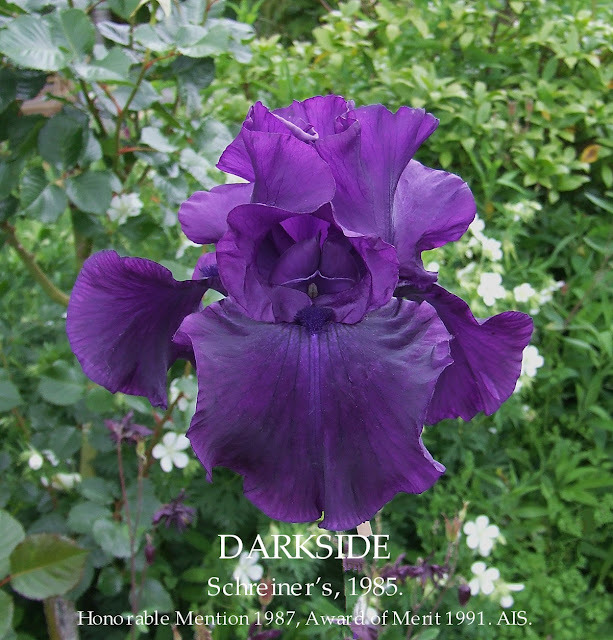 The SUN BELT AWARD, given to the Best Proven Variety (i.e., one that has been on the market at least 4 years; this year’s winner had to have been released prior to 1986): DARKSIDE (Schreiner 1985). A great, quality complement to the Contemporary Award winner, ‘Silverado’, this is the ultimate in a very advanced line of Schreiner irises that consistently have choice progeny. Even in the Blanchard garden, where Miss Kitty had salvaged what was left of the June flood last year and replanted as late as November, ‘Darkside’ produced tall, well branched stalks this spring. 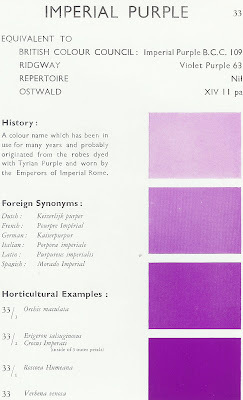 Broad, blocky flowers are purest deep violet (approaching black) with light to moderate ruffling and a silk sheen. The overall form is even better than the very fine ‘Titan’s Glory’ (Schreiner) or ‘Dusky Challenger’ (Schreiner). Exceptionally vigorous, a consistent bloomer (obviously, if it bloomed in Blanchard this year! ), and strong, telephone pole stalks that will not fall over in Okie winds, even with 3 or 4 of its large blossoms open. 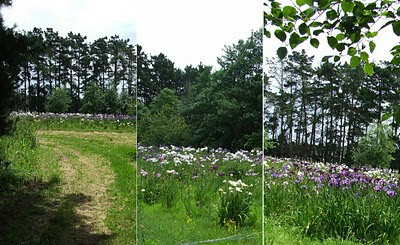 It makes for a good garden iris in the clump, too, as the 3 to 4 branches are modified candelabra. What is most impressive is that, even though the flowers are huge, it has backup buds that open in a proportionate size and with good bloom sequence.